By people protesting the clothing giant’s failure to pay reparations for the 2013 Rana Plaza building disaster in Bangladesh. 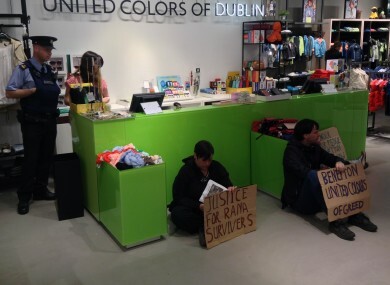 PROTESTERS ARE OCCUPYING the Benetton store in Dublin’s St. Stephen’s Green shopping centre this evening. The action is being taken in protest of Benetton’s failure to make good on the reparations due to the victims of 2013’s Rana Plaza building collapse in Bangladesh, the second anniversary of which is tomorrow. Protesters Gerry Lydon and Aisling Butler spoke to TheJournal.ie at the scene, and said the aim of the protest was to remind Benetton that ‘it’s time to pay up’. “They think they’re really good for playing the €1 million they have paid so far – there’s five times that amount due from them, we can’t forget that,” said Butler. This just shows that you can protest peacefully without worrying about getting arrested,” says Lydon. Every company involved in the Rana Plaza disaster have disgraced themselves, but at least the likes of Primark have actually paid up. The six protesters are planning to stay in until closing time of 9pm this evening. Apart from one garda who was on the scene when TheJournal.ie was present, the protest seemed to be a peaceful one. There’s 639 other protests going on around the world today in protest of Benetton’s failure to pay the full compensation due, although only the one in Ireland. 1,129 people died when the Rana Plaza building collapsed in Bangladesh on 24 April, 2013, with approximately a further 2,500 people injured, many severely. It is seen as the worst clothing manufacture accident in history, as well as the deadliest structural failure of a building in modern times. Email “Benetton on Dublin's Stephen's Green is being occupied this evening...”. Feedback on “Benetton on Dublin's Stephen's Green is being occupied this evening...”.